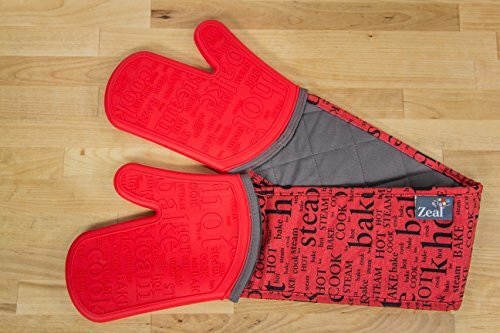 Zeal's Steam Stop Waterproof Double Oven Glove is the best oven mitt to have in your kitchen. 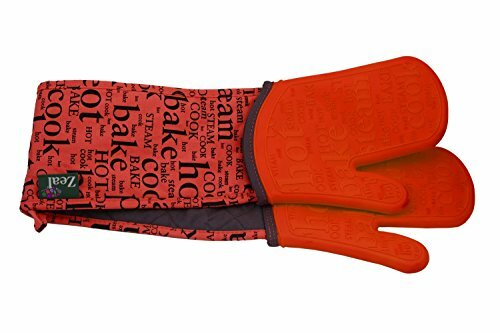 You'll never need to search for a hot grab or second oven glove again, and your arms and body will always be protected. The 100% premium silicone is heat resistant to 482F (250C), providing great protection against heat, and the quilted cloth interior is ultra comfortable. 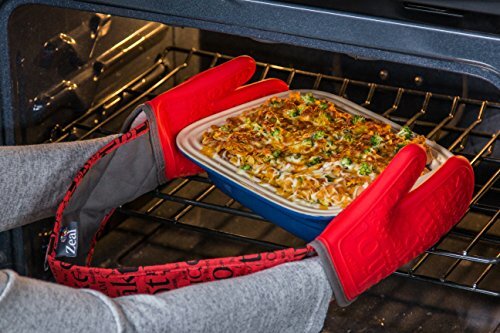 The silicone portion of the glove features a raised text pattern that provides a non-slip grip, allowing you to remove a batch of fresh baked cookies, serve hot dishes directly from oven-to-table, or grab hot potatoes right off the grill with ease. The glove is stain resistant and easy to clean in the sink or washing machine. The red text pattern is a great way to add to a kitchen, whether it's for you or as a gift for someone special. Kitchen Innovations has put all of their knowledge and experience into spreading the joy of cooking with the Zeal brand - developing innovative products that bring efficiency, ease and fun into your kitchen. Accent your kitchen with Zeal!